We look forward to welcoming you to our 18th century inn, located in Ripley near Woking, Surrey offering comfortable accommodation with a great atmosphere. Room price guarantee. Book direct through our website or by phone, to get the best price. We guarantee that this price will not be beaten anywhere else. The Half Moon has recently undergone a major refurbishment to the highest standard. 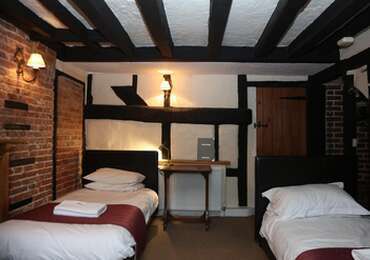 Our accommodation is very comfortable and all are en-suite except our triple room, which has its own private shower room. A full menu with a wide selection of beers and wines is available at lunchtimes and evenings seven days a week. Dog friendly (well behaved dogs are very welcome in the bar area). The Half Moon is a Gastro-pub and Bed and Breakfast situated in the heart of this beautiful and historic village of Ripley, Surrey, very close to Woking and Guildford very easily located just off the M25 at junction 10 off the A3. Ripley boasts a great selection of pubs and coffee shops and restaurants. There is also a beautiful village green and historic cricket club. The Royal Horticultural Society Gardens at Wisley are just 1.5 miles away. When visiting Ripley, make your stay perfect by staying at The Half Moon Inn Bed and Breakfast as a great alternative to large hotels in Woking and Guildford. 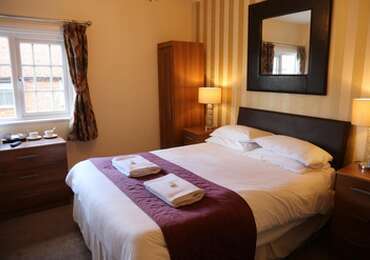 Double room, tea coffee facilites, free wi fi,Plasma tv. 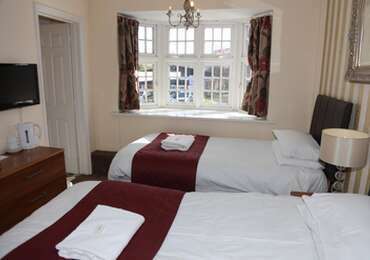 Twin room, tea coffee facilites, free wi fi,Plasma tv.